Students surreptitiously texting from the back of the classroom – while half-paying attention to the lecture – probably think professors don't know what's going through their minds. Eve De Rosa, associate professor of human development and an expert in the neurochemistry of cognition, knows precisely what's coursing through those multitasking brains: the neurochemical acetylcholine. As De Rosa explains: "Acetylcholine is best known for its role in Alzheimer's disease, but we're learning more about its contributions to cognition in people of all ages." "The guiding hypothesis for the work I do," she adds, "is asking whether something like Alzheimer's, generally thought to be a memory disorder, is actually an encoding disorder, with information not getting 'packaged' and not reaching memory centers of the brain in the first place." One task for the rats in De Rosa's lab is to use their noses to choose particular symbols on a touch screen. They learn this trick quickly and efficiently – unless their brains are short on acetylcholine. 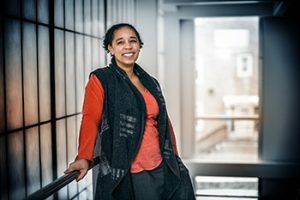 De Rosa came to Cornell in 2013 and says that from the start, she could detect a certain "collaborative energy" in the air. "I'd been at University of Toronto for a decade when I guest lectured about my rat work to researchers in the Department of Neurobiology and Behavior," she recalls. "After the talk, people asked about acetylcholine in human cognition, so I continued to speak about my work with children and the elderly. A few weeks later, faculty from human development contacted me and said, 'Have you ever thought of moving?'" Happily ensconced at Toronto, De Rosa was reluctant to accept the invitation – until she recalled her interactions with Cornellians. "There was so much palpable, collaborative energy and creativity here," De Rosa says, "and that's what attracted me to Cornell." De Rosa's teaching responsibilities include pre-med courses, like Neurochemistry of Human Behavior, where undergraduates learn about the Nobel Prize-worthy discovery, in 1915, of acetylcholine. The phenomenon of nerves using chemicals to communicate was deduced from acetylcholine's action on the heart. Among her collaborators is spouse Adam Anderson, also an associate professor of human development and a neuroscientist specializing in the role of emotion in human faculties. Their research project? How the heart and mind are connected through chemistry – which has led to further collaboration, with electrical and computer engineering's Bruce Land. Posted in Features and tagged acetylcholine, Affect and Cognition Lab, cognition, cornell university college of human ecology, Eve De Rosa, human development, Human Neuroscience Institute, memory, neurochemistry, neuroscience on June 9, 2017 by Allison M. Hermann, Ph.D..